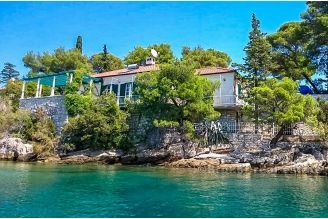 Business-residential building, semi-detached, for sale, located in a very attractive location near Split, in the first row by the sea and a beautiful pebble beach. Given the very attractive position, the house has huge future potential, although it requires complete adaptation and finishing of the highest floor. 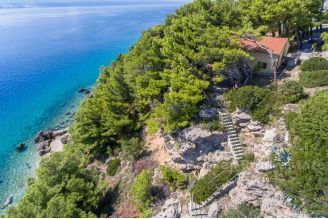 The house is spread over three floors (ground floor and two floors), the total floor area of ​​160 m2, ie, 480 m2 of living space, with additional storage space for the boat on the beach, size 35 m2, on a plot of total area of ​​821 m2,where is a large courtyard with orchard in front of the house and a spacious parking lot for many vehicles located behind the house. The house is habitable and functional, but it requires a lot of work to adapt the existing situation to the needs of modern times. 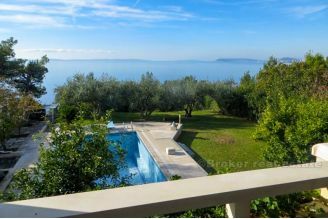 Given the potential of its location by the sea, large parking lot and spacious living space, the house is ideal in terms of business investment for tourist rental. In front of the house, on the beach, there is a storage for a boat that can also easily be converted into an additional housing unit. 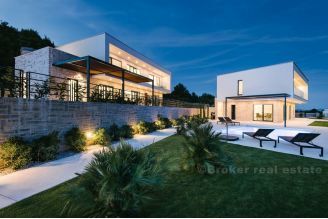 Certainly, a very interesting offer and location which will excite the interested buyers, though the future buyer must be ready for additional investment in the form of adaptation of the existing condition.